In this CritCases blog – a collaboration between STARS Air Ambulance Service, Mike Betzner, ORNGE Air Ambulance and EM Cases – we present a case of a 30 week gestational age pregnant woman with high blood pressure, headache, blurry vision and pelvic cramping. We discuss the management challenges of transporting a patient with severe pre-eclampsia and preterm labor, with special attention to dosing of magnesium, antihypertensive agents choice, and indications for steroids, tocolytics and antibiotics. A 35-year old G1P0 woman presents to a small rural ED complaining of 10 hrs of 4/10 regular period-like pelvic cramping radiating into her lower back as well as gradual onset 8/10 diffuse “throbbing” headache accompanied by blurring vision. She denies vaginal bleeding, urinary symptoms, GI symptoms, fever or chills. She denies neck pain or stiffness, limb weakness or numbness or speech difficulty. Her Group B Strep status is unknown. According to her LMP she is approximately 30 weeks gestation. She has had no prenatal care to date. Her past medical history is unremarkable and she does not take any medication. Her vital signs in the ED reveal a BP of 175/115, heart rate of 95, respiratory rate of 17 and temperature of 36.5. Her GCS is 15, PERL, gait normal, no pronator drift, but her extremity deep tendon reflexes are hyper-reflexic. Her chest is clear. Her lower abdomen is tender with no periotneal signs and no organomegaly. Her cervix is 2 cm dilated and soft. There is some greenish discharge per os. A urine dip shows 3+ protein and 2+ blood. Routine blood work is sent, but no results are available at this time. The time to arrange for and complete a transfer to the closest tertiary obstetric center is approximately 4 hours. What is your initial impression and what are your treatment priorities? This patient may be in early preterm labor and should be presumed to be suffering from severe pre-eclampsia which both need to be addressed immediately. She will need to be transferred to a tertiary care center where there is a neonatal team capable of caring for a 30-week neonate and a mother with pre-eclampsia / eclampsia. It is essential to consult early and develop a shared care plan with a high-risk obstetrician as soon as possible. While the urine dip is suggestive of pre-eclampsia, lab tests should be sent to confirm the diagnosis, rule out HELLP and help prognosticate. CBC, electrolytes, LFTs, and urinalysis should be sent off. While arranging transport of this patient, consideration should be given to time sensitive treatments including blood pressure reduction and seizure prevention, optimizing the fetal conditions for delivery (antibiotics and steroids) and arranging for the possibility of delivering as soon as the patient arrives at the tertiary care center. Pre-eclampsia is surprisingly common in Canada, developing in approximately 1 out of every 100 pregnancies and eclampsia in 1 of every 1000 pregnancies. It is the second most common cause of maternal death after postpartum hemorrhage (1). As pre-eclampsia is relatively common, every perinatal unit should have a protocol for treatment of severe hypertension. What are your initial treatment priorities for pre-eclampsia and preterm labor? Lower dose magnesium: The guidelines for MgSo4 doses vary significantly in various study protocols, textbooks, and online clinical resources. The Society of Obstetrics and Gynecology of Canada (SOGC) and the American College of Obstetricians and Gynecologists (ACOG) both recommend starting at lower dose MgSo4 which is thought to result in fewer side effects (2,3,4). However there is evidence to suggest that the rate of side effects is low with traditional high dosing. For example a systematic review looking at side effects of MgSO4 for pre-eclampsia amog 9556 women in 24 studies utilizing a range of dosing regimens found that the rate of absent patellar reflex was 1.6% and the rate of respiratory depression was 1.3%. There was only one maternal death attributed to the use of magnesium sulfate (5). Use a 50 ml syringe and draw up 4 g (8 ml) MgSO4 and then add 22 ml 2⁄3/1⁄3 to make a total volume of 30 ml. Administer over 30 minutes at an infusion rate of 60 ml/hour, using a volumetric infusion pump. Draw up 20 g (40 ml) MgSO4 and add to 960 ml 2⁄3/1⁄3 (1,000 ml total). Infuse at 1 g/hr (50 ml/hr) using a volumetric infusion pump. MgSO4 4 g IV over 20 minutes then 1 g/hour for 24 hours is now the most commonly cited initial MgSO4 dose and is classified as Level 1-A evidence in the most recent guidelines from the SOGC (3). Patients on Mg infusions should to have respirations monitored, have their deep tendon reflexes checked regularly and have 10 cc of 10% calcium gluconate on hand in case of overdose. Administration of calcium is rarely required, but should be immediately available, especially in transport situations. After speaking with the obstetrician you administer MgSO4 4g IV over 20-30 mins. As the loading dose is finishing the patient starts to seize. Will you give an additional magnesium bolus or infusion now that the patient is seizing after your initial dosing? Further Seizures should be treated with an additional bolus of Magnesium 2 g IV. It is recommended that an additional 2 g is given over 5 minutes followed by an infusion of 1.5 g/hour. It is essential to monitor very closely for respiratory depression and speak to the receiving obstetrician for guidance. If two such boluses do not terminate the seizure, a second line agent such midazolam 5 mg IV should be considered. How will you treat the hypertension? There is some variability in the recommendations of dosing and administration of antihypertensive agents. Intravenous labetolol and hydralazine have been long-standing first-line agents for the treatment of severe hypertension, but recently, oral nifedipine has also been recommend as a first line treatment, particularly when IV access is not available. Some expert opinion has suggested that hydralazine is associated with a higher rate of side effects such as maternal hypotension and fetal distress, and so may be reserved for second-line use or when labetolol is contraindicated (eg. maternal asthma or CHF) (6). A Cochrane Review in 2013 suggests that nifedipine is associated with less persistent hypertension than hydralazine and possibly less side effects compared to labetalol (7). Labetolol 20 mg IV then 20-80mg q20-30 mins to a maximum dose of 300mg or constant infusion 1-2mg/min IV to a target BP <160/110. Nifedipine 10-20mg orally, repeat in 30 mins prn; then 10-20mg q2-6h. Will you administer steroids and antibiotics prior to transfer? Corticosteroids are indicated to improve fetal lung maturity for preterm labor between 24 and 34 weeks gestational age when delivery is not an immediate possibility. The most recent Cochrane review in 2017 on antenatal corticosteroids for women at risk for preterm birth included 30 studies of 7774 women and showed that treatment with antenatal steroids compared with placebo or no treatment was associated with a reduction in perinatal death, neonatal death, respiratory distress syndrome, intraventricular hemorrhage, necrotizing enterocolitis, need for mechanical ventilation and systemic infections in the first 48 hrs of life (8). Any patient with severe pre-eclampsia, eclampsia, or HELLP syndrome needs to be delivered as soon as possible. This case is very challenging as there is no option for a safe delivery in this community and there will be a delay. The use of steroid in this patient could potentially be useful. The SOGC clinical practice guidelines on the prevention of early onset neonatal Group B Streptococcal Disease recommends that all women who are < 37 weeks gestation and in labor or with rupture of membranes with intravenous group B streptococcus antibiotic prophylaxis for a minimum of 48 hours, unless there has been a negative vaginal/rectal swab culture or rapid nucleic acid-based test within the previous 5 weeks (9). Antibiotics: Ampicillin 2 g IV or Penicillin G 5 million units IV for unknown Group B Strep status is routinely given. If the patient’s GBS status is known to be negative, then this would not be necessary. Will you administer a tocolytic? This is her first pregnancy and she has not progressed far. Given that she will likely be delivered upon arrival at the receiving hospital as definitive treatment for the pre-eclampsia, a tocolytic would not be recommended in her case. Tocolytics can be effective in rapid inhibition of premature uterine contractions and are generally considered safe in the transport environment (10). As delivery in an aircraft or ambulance could be disastrous, it would be prudent to discuss options with the receiving obstetrician if the transport times or delays would prevent her from getting to definitive care over the next few hours. If the consulting obstetrician felt a tocoloytic was indicated, nifedipine might be the best choice as it could be used to positively impact on both BP control and possible tocolytic effects if used in lieu of labetalol. The optimal dosing is not clear and should be discussed with the receiving obstetrician. Indomethacin would be a poor choice, as it has been implicated in exacerbating or triggering pre-eclampsia (11). In the setting of oliguria, will you administer fluids to improve urine output? Fluid administration should be judicious and fluid balance should be monitored very carefully. Detailed input and output recordings should be charted (i.e., q1h). Careful fluid balance is aimed at avoiding fluid overload. The total IV rate should be limited to 80 ml/hour (approximately 1 ml/kg/hr, using current weight). Even in the setting of oliguria and severe pre-eclampsia, guidelines recommend not to give fluid boluses (3, 12). During transport you get a call from the base hospital that the platelet count is 45 x 10^9/L with evidence of hemolytic anemia. Will you transfuse this patient with platelets on arrival at the hospital? I would not give platelets unless there are signs of catastrophic bleeding such as confirmed ICH with severe thrombocytopenia, again, in consultation with the receiving OB. HELLP syndrome is thought to be a form of severe pre-eclampsia characterized by hemolysis, elevated liver enzymes and low platelets. It is characterized by significant mortality related to disseminated intravascular coagulation, pulmonary edema, liver infarction or hemorrhage and placental abruption. Principles of management again include blood pressure management, seizure prophylaxis and expedited fetal delivery. For a platelet count <20 x 10^9/L and HELLP syndrome, platelet transfusion is recommend regardless of mode of delivery. SOGC recommends transfusing platelets for C-section deliveries when platelets are <50 x 10^9 / L and for vaginal delivery when platelets are <20 x 10^9 / L and also for excessive active bleeding, known platelet dysfunction, those where platelet count is rapidly falling, and for those with known coagulopathy (3). Remember that platelet transfusions carry a significant complication rate and as such should be used with caution. Many smaller hospitals do not stock platelets and this might not be an option. In order to streamline care, speaking to the high-risk obstetrician and possibly the anesthetist for guidance regarding blood product administration would be helpful early in the transfer process. Ultimately, this patient with severe pre-eclampsia was transferred to a tertiary care center and was delivered by c-section with a good neonatal outcome. During the transfer, she remained on MgSO4 1 g/hour and a labetalol infusion at 1 mg/min. She received 1 pool of platelets on arrival to the tertiary care center. She had subsequent resolution of hypertension and did not develop any further sequelae. Guest Expert Peer Review by Glenn D. Posner, MDCM, FRCSC, M. Ed. Medical Director at uOSSC, Simulation Educator at RCPSC, Associate Professor at University of Ottawa in the Department of Obstetrics & Gynecology. Thankfully, the seizing parturient is a sight that most obstetricians in Canada will only witness once or twice per career. When we do see it, it is often in the context of a patient with minimal antenatal care because so much of modern obstetrical practice is geared toward screening for pre-eclampsia and intervening early to prevent this complication. Interestingly, preterm labor and severe pre-eclampsia often travel together. I like to say that the body is smarter than we are and knows very well that delivery is the best cure for pre-eclampsia. The top considerations for transport in my mind are preventing seizure in mom and optimizing the fetal lungs in anticipation of premature delivery. To this end, a loading dose of 4g of magnesium sulfate followed by an infusion of 1g/hr is appropriate. However, I cannot stress enough that accidental overdose of magnesium sulfate is a significant risk, and the transporting physician needs to be hypervigilant regarding the rate of infusion and the potential for crossing of IV tubing and bags during transfer. In cases where patients are transferred without the ability to closely monitor the infusion pump, I would suggest IM injection of the magnesium sulphate (Two deep intramuscular injections of 4 to 5 g magnesium sulfate 50% solution into each buttock; the total dose of up to 10 g injected into one site is highly irritating). This IM regimen follows the routine 4g IV bolus and can be repeated every 4 hours, as needed for transfer. As indicated, another benefit of magnesium is for fetal neuroprotection. For fetal lung maturation, 12g of betamethasone IM or 6g of dexamethasone IM are recommended as soon as possible. This will have a secondary effect of decreasing the inflammation associated with pre-eclampsia and may temporarily improve the liver enzymes. Regarding the use of tocolytics, their use in modern obstetrics (since they don’t really work very well) is restricted to transfer situations and in order buy time to get steroids on board. Maximal effect on fetal lung maturity is at 48 hours after the first dose, so we will sometimes use tocolytics in order to achieve this. In this case, the magnesium sulfate itself is a reasonable tocolytic and I would not recommend adding anything else. Furthermore, the patient should be examined immediately prior to transfer and if there is any doubt that she will make it to the receiving hospital, she should not be moved and a neonatal transport team mobilized instead. The body is smarter than we are and knows very well that delivery is the best cure for pre-eclampsia. Pratt et al. 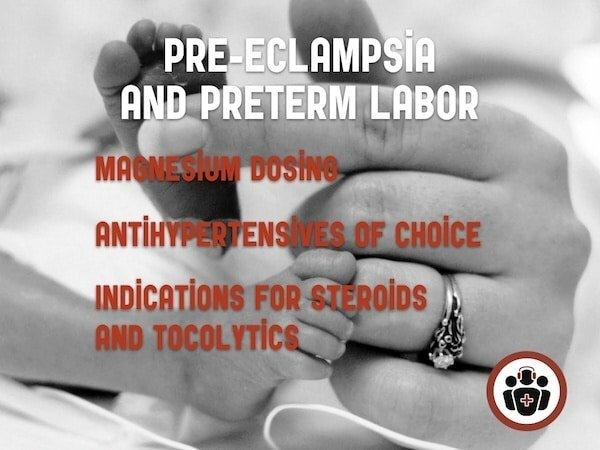 Alternative regimens of magnesium sulfate for treatment of preeclampsia and eclampsia: a systematic review of non-randomized studies. Acta Obstet Gynecol Scand – February 1, 2016; 95 (2); 144-56. Emergent therapy for acute-onset, severe hypertension during pregnancy and the postpartum period. Committee Opinion No. 692. American College of Obstetricians and Gynecologists. Obstet Gynecol 2017:129:e90–5. Duley L, Meher S, Jones L. (2013). Drugs for treatment of very high blood pressure during pregnancy. Cochrane Database Systematic Review. Jul 31;7:CD001449. doi:10.1002/14651858.CD001449.pub3. Review. PubMed PMID: 23900968. Roberts D, Brown J, Medley N, Dalziel SR. Antenatal corticosteroids for accelerating fetal lung maturation for women at risk of preterm birth (Review). Cochrane Database of Systematic Reviews 2017, Issue 3. DOI: 10.1002/14651858.CD004454.pub3. Money D, Allen, V. The prevention of early-onset neonatal Group B Streptococcal Disease. SOGC clinical practice guideline.J Obstet Gynaecol Can 2013;35(10):e1–e10. McCubbin K, Moore S, MacDonald R, Vaillancourt C. Medical Transfer of Patients in Preterm Labor: Treatments and Tocolytics. Prehosp Emerg Care. 2015 January-March;19(1):103-109. Epub 2014 Aug 25. Mousavy SM. Indomethacin induces hypertensive crisis in preeclampsia irrespective of prior antihypertensive drug therapy. Am J Obstet Gynecol. 1991 Nov;165(5 Pt 1):1577. Anthony J, Schoeman LK. Fluid management in pre-eclampsia. Obstet Med. 2013;6(3):100-104. Dr. Sean Moore is a practicing emergency physician from Kenora Ontario. He is currently the Medical Director of Education for Ornge Transport and the Chief of Emergency Services at Lake of the Woods District Hospital. Great Post, Loved the rural angle on this topic! Definitely makes me feel more comfortable having this knowledge. Thanks. Anton, I just want to thank you for such a outstanding and BRILLIANT podcast! You have reignited my enthusiasm for the study of medicine and emergency medicine in particular. Your podcast on emergency medicine is definitely the best one I’ve ever listened to and I listen to them ALL. Keep up the great work and please know, that you are quite literally saving lives with your podcast! Thanks so much for the kind words Ted. It’s listeners like you who remind why I produce EM Cases in the first place!